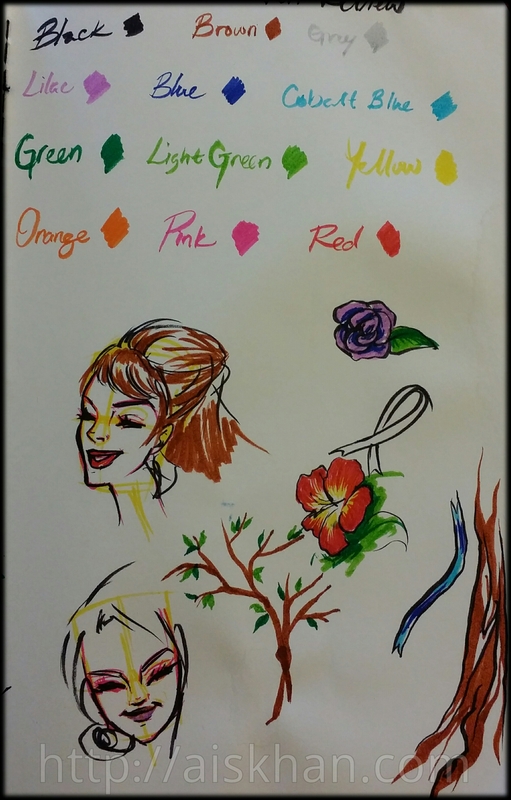 So I recently purchased a pack of 12 of Kuretake’s Clean Color Brush Pens. Here is a review I have done of them so far. So I first swatched all the colours to see what they looked like. They have great pigment to them, are really bright and don’t appear to bleed through the paper (I used a plain moleskine notebook). Afterwards I played around with some doodles. These pens create finer lines than Pentel’s brush pen, which I like. You can see with the flowers I tried blending the colours, I learned afterwards that there was a better way to blend them. The tree branches and leaves were testing brushstrokes. Overall, I like these pens, they’d be amazing for when I do gesture drawings. Furthermore, I’d like to see if I can use water with these pens, so you may see a secondary review on them in the future.